The Como Flat spot, is named after Tiger Woods' golf consultant Chris Como, and the work he has done since 2011. It is the idea that elite golfers develop a flat spot in their club arc, that helps produce more repeatable swings. This flat spot is both high to low, and in to out, In this video, you can see how our system coaches a swing that develops a good flat spot, how to visualize what in the swing makes it so, and some 3D graphs to help you see the practical goal of the concept. Ball Throwing Timing How to properly apply this popular and age-old concept to a "tour" release. Free Swinging Supination Understand the benefits of proper lead wrist supination and how to train it. Ribbon Path Training Use a piece of ribbon tape to gain a better understanding of your club path. Axial Velocity Explained with 3D Learn why the motorcycle movement is part of any tour golf swing. Hands Low To High During The Release Having the hands working flat, or slightly up, is a key component to having a tour release. Connecting Body Rotation To Arm Movements Everything is integrated in the swing. If your body isn't open at impact, you should look at your arms. Brush The Ground - Advanced Decode the different components that go into getting the club to brush the ground in the right way. Brush The Ground For a lot of golfers, focussing on where the club contacts the ground can be game changing. Myview - Push Ball MyView of a great drill for feeling the movements between impact and follow through position. Find The Ground, Then The Ball There are two contacts in a golf swing, with the ground and with the ball. Learn how to use your practice swings to help train your full swing. 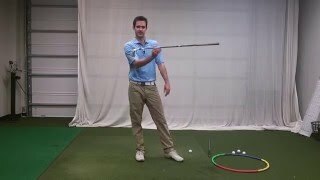 Famous Line Drill A simple way to monitor the location of the low point during your swing. Push Ball The push ball is a great way to work on impact positions and getting the club to brush the ground at the same time.